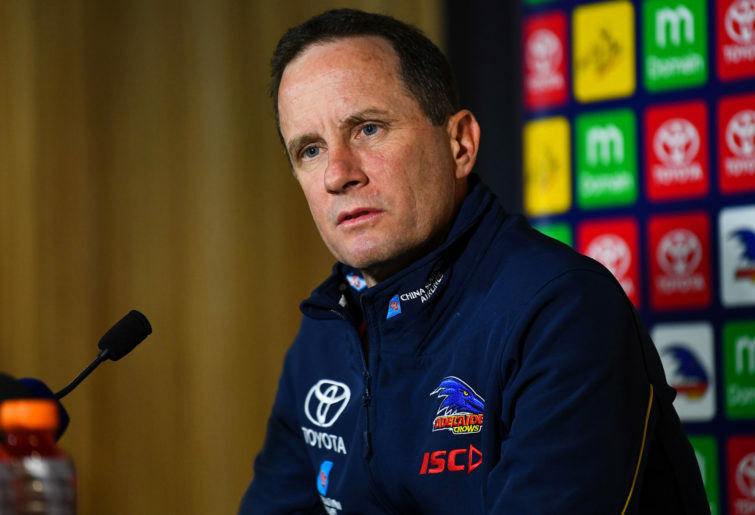 Thus far, Don Pyke has generally been regarded as the right man for the job following the tragedy that struck the Adelaide Football Club in 2015. In all of the discussion around where it all went wrong for the Crows during and after the 2017 grand final, Pyke has largely escaped unscathed. Don’t get me wrong, I still twitch when someone uses a phrase even remotely similar to collective minds. And while I’m still unhappy about the way the club managed the grand final loss in 2017, I don’t know enough about the inner workings of a club to suggest whether Brett Burton’s criticism has been justified. Likewise, fair or unfair, a captain will always cop some heat. Now though, I think it’s time to put the spotlight fairly and squarely on Pyke and his coaching staff. Last year, the game plan and selections couldn’t be blamed for the season’s result because it was obvious to one and all that injuries and off field drama were the cause of poor performance on-field. But it’s 2019 now and despite having nearly the healthiest list in the competition at season’s start, the Crows seem to have slipped right back into 2018’s mould. Inconsistency coupled with a general lack of skill and effort are once again the hallmarks of Adelaide’s game, at least after the first three rounds. Perhaps? How, in a professional sports team where people are being paid exorbitant amounts of money to ensure that doesn’t happen, does that happen? If the Crows did in fact drink their own Kool-Aid, surely that’s at least in part a failure on behalf of the coaching staff. On the face of it, it would seem that the Adelaide coaching staff haven’t prepared these players at all well for the season – and mental unpreparedness is becoming a nasty recurring theme for this club. First the 2017 grand final itself, then the 2018 pre-season camp, now Jenkins admits they weren’t switched on in 2019 because they thought it was all just going to happen for them. I see an insidious trend there. And then there’s the issue of selection. Through long periods of 2018 Don Pyke chose to ignore form and output, favouring a hope that certain players might turn a game. Those particular players’ form hasn’t improved so far in 2019. I refer to names like Taylor Walker, Jenkins and Eddie Betts. They appear to be The Un-drop-ables. Names so heavily etched into the turf at West Lakes that dropping them is too taboo to even consider, irrespective of their form line. Against Geelong in Round 3, Walker had one goal and seven disposals. Jenkins had one goal and ten disposals and Betts had 15 disposals but no goals. Sure, Tex presents an imposing figure. And Jenkins has size. And everyone knows what Eddie Betts is capable if he fires up. But is what they’re offering up that much better than what Darcy Fogarty, Elliott Himmelberg and Tyson Stengle would? I find it hard to believe that those three couldn’t kick one each and have ten or so touches. First and foremost, Tex, Eddie and Jenkins are forwards. And between them for 2019 they have kicked 8.8. That’s less than three goals per game from your three highest profile forwards. Can they turn it around? Of course they can. But how long do you keep young players who are knocking at the door out because of a hope that your senior players will be better? So whether it’s the mental preparedness of the players or making the tough calls at selection, I think right now Don Pyke and his men have some explaining to do. Yes, it’s only Round 4, and well might the Crows come out this weekend and belt North Melbourne (who are in a dark place themselves). But as the so-called experts say, winning papers over a lot of cracks.